I was in the middle of reading The Knife of Never Letting Go, when suddenly, the contemporary mood kicks in. So I just scrolled through my e-reader, and find this book being the only contemporary there I haven't read. I know nothing about this book (which is the first time, since I always read the summary before reading) and take a leap of faith. Turns out it was really worth it. I really liked this one. I think this book sends a really great message to readers. Our main character, Sam, has pure-O OCD. She's not tidy or keep fixing things, like common perception of OCD. But she thinks about something, she couldn't stop thinking about it. She can't sleep, she'll get anxiety, and just interferring with her daily life. This book really potrays that part accurately. The author has done research before writing this book, and it's shown in the way she potrays Sam. Her stream of thoughts from when she's fine to when she's obsessing are gradual and nicely paced. The great things are Sam has great, supportive family that always by her side, and has really healthy relationship with the psychiatrist. I mean, she's hiding her OCD from her friends, but she's seeking for help. And I think that's a really great message. 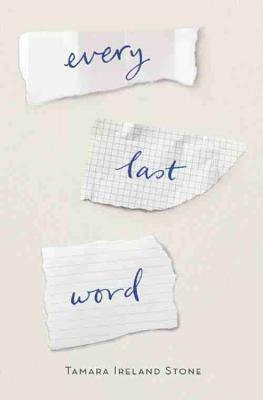 This book also deals with typical high school life; popular cliques, toxic friendships, and crushes, which makes this book even more relateable and heartfelt. I was really surprised when I read about Caroline though, because I just finised The Dream Thieves and I can't have Noah 2.0. But I'm really glad that's not the case, even though that chapter really broke my heart. I felt really sorry for Sam. I'm not an expert on poetry, nor have I ever understand one, so I won't give any review about that aspect. But I really like the people in Poet's Corner, how open and friendly they are, and how acceptable they are with Sam. So overall, I really enjoyed this book. The story is simple and really heartfelt. It doesn't have memorable characters, but the story itself is really beautiful. I really liked this book as well! I really liked how Sam was portrayed not as a stereotypical person with OCD. So many people have stereotypes on how OCD works, and this book (and many others) clears it up. I really didn't see that plot twist with Caroline too! I was so surprised! Really, with all the YA Contemporary books dealing with mental illnesses I read, I should have seen it coming... :) Great review! I also don't read contemporary, but when the mood hits I usually just switch it up! XD I really hope you'll enjoy it, this one is really good! I'm really glad that you could relate to the main character because I know that it's really hard relate to books. I'm also happy that you enjoyed reading the book because I really enjoyed it when I read it. This is also another book where the characters aren't perfect, which to me just makes them more realistic. I read this one last year and loved it! I am so glad you did too. This is one of my favorite books too. I wasn't expecting it to hit me so hard with the feels, but it totally did and I was so happy I picked it up. I thought the OCD was handled really tactfully too. I'm glad you enjoyed this, Tasya! Ooh yeah this book also took me by surprise! I didn't expect to like it as much as I did! Thank you!